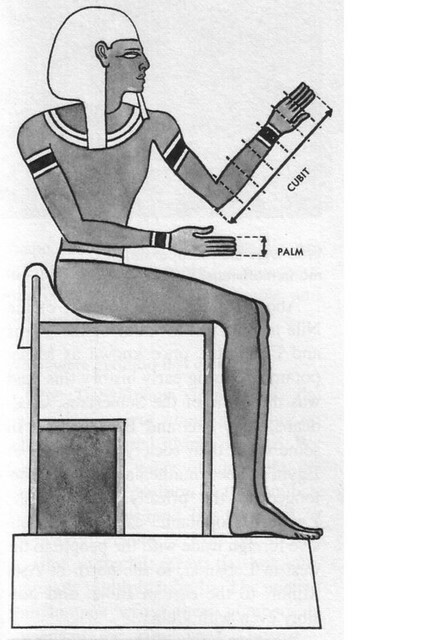 The cubit was Ancient Egypt’s standard unit of measure, much like our foot or meter measurement. There were two cubit lengths in ancient Egypt: the short cubit and the royal cubit. The short cubit was the distance from the elbow to the tip of the middle finger of the pharaoh. The royal cubit was the distance from the elbow to the middle fingertip, plus a palm width. 1. Separate children into pairs. They will take turns measuring each other from elbow to the tip of the middle finger using the measuring tape. They should record this number, as they will need it shortly. 2. Now, using stiff cardboard, students will measure out the same length as their measurement from elbow to fingertip and cut the cardboard to this length in the shape of a standard ruler. 3. They should then divide the cubit into palms and digits using four fingers of the hand for the palm and one finger-width for the digit divisions. 4. Using markers, students should neatly record the following information on their cubit: Their name, length of the cubit in inches, and length of the cubit in centimeters. 5. Ask the class if all of the cubits will be the same length. Why or why not? 7. 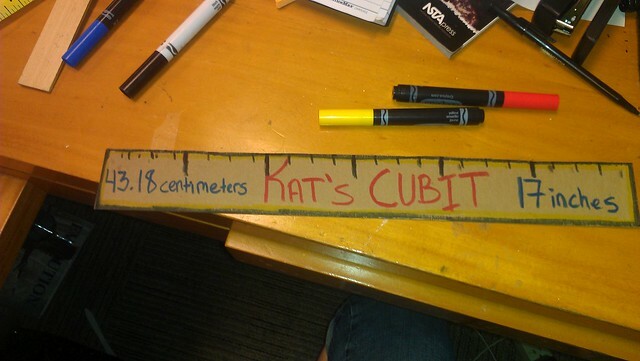 Measure different items using your cubit.